This is the demo which was presented at Embedded World 2007. The demo acquires angle and distance from a compass and a ultrasound receiver, sending them to a remote system using an XBee module connected through UART. On the PC side, then, a GTK graphical application (not available for download) displays the data in a polar plot. Board schematics, PCB and software available as a template under ERIKA Enterprise. 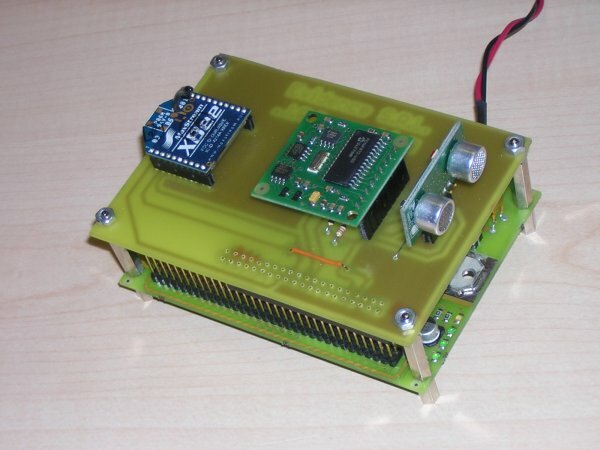 The software is an EE application which acquires information from a compass and a ultrasound receiver, sending them to a remote system using an XBee module. The application is distributed with ERIKA Enterprise since version 1.4.0, and shows how simple is the implemenattion of a Zigbee-serial gateway which interfaces SPI/I2C peripherals with a dsPIC. None; the demo is distributed with ERIKA Enterprise.